Mobile first! That’s the rally cry heard ‘round the Internet. The problem is that it is the exact opposite of a traveler’s journey as it stands today; many turn to mobile at the end of the process, during the trip. Most travel planners prefer to conduct their pre-travel activities on the desktop and laptop. While there are good reasons to make mobile a priority—from the 50% increase in travel-related searches on mobile to improved search rankings to controlling design costs—the perception that everything is mobile or mobile only, is misleading. In fact, what’s more common is using multiple devices during the day and for adults to choose the best device based on their objective. Research from Expedia Media Solutions in 2017 shows that most of the world, especially U.S. and Canadian travelers, prefer their desktops and laptops for inspiration, research, and actually booking their trips, and by a large margin. The preference is especially prominent for booking, with 83% of Americans and 90% of Canadians preferring their home-based computers for finalizing their plans. It’s apparent that they don’t completely trust the mobile experience for this step. When they are at your destination, it’s a completely different story: it’s all about the mobile. Our experience with our destination-marketing clients mirrors that finding. The graph above from the Google Analytics™ service shows web visitors planning their trip in late spring on the desktop for later in the summer, then moving to mobile during the trip. The inverse and defined spikes correlate between the workweek and the weekends during their actual visit. This client’s primary audiences, families with children traveling for extended weekend visits, are heavy mobile users. If your destination involves older adults, longer stays, and greater investments in time and money, expect an even greater split between the home-based computer and mobile visits. Not only do your customer communications have to wow them on mobile and desktops, they have to carry that experience seamlessly when they move from one device to another. The modern traveler could very well start with a text link from a friend (modern word of mouth) to a mobile site. They might begin the process there, stop, complete more research later on a laptop, and finalize their trip on a desktop. And they would expect their activities to move with them from device to device without hurdles or restarting the process over. That seems intuitive to users, but it can be a challenge for marketers. Show them what it looks like. Take amazing images—big hero shots—that really convey the feeling of your destination and what it’s like to be there at the time of their visit. Whether it’s romantic or peaceful or exciting and action-packed, make sure that it reflects your destination in the best light. Lead them to their ideal trip. Make the site easy to navigate by the intent of the visitor, not where you want them to go. It’s their trip. Help them discover what they want to do that you have to offer and deliver it to them the way they want it. If it’s a blog or other text, make it easy to read. If it’s a video, embed it in the site; don’t make them click away. When they discover what they want, reach out and make a connection. Offer a specific piece of content or other offer that applies specifically to them. This shows that you understand them. It also enables and gives you permission to contact them again, critical if you’re going to reach them across all of their devices. The growth in mobile has been nothing short of astounding. 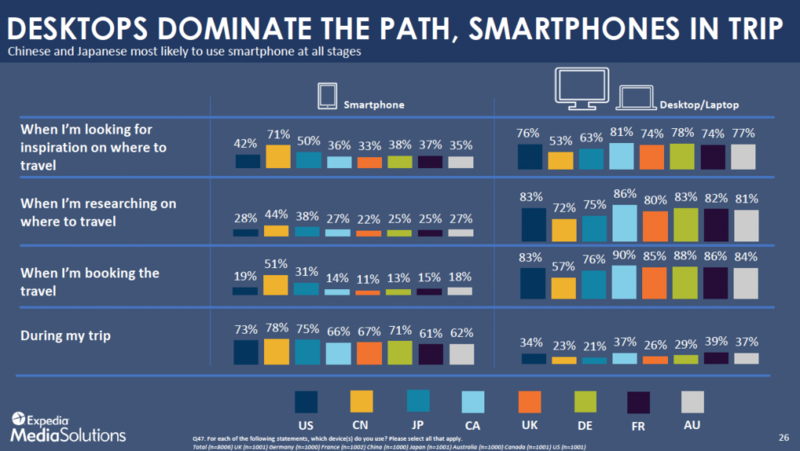 Mobile isn’t going away and doesn’t show signs of slowing down. But as a destination marketer you need to recognize where your audience is in the journey and meet them there. Identify what their intentions are and be mobile ready, but realize that it’s not a mobile-only world. Not yet anyway. Download Destination Marketing Merges onto the Digital Highway to learn more about the latest destination marketing technology. Subscribe to our newsletter for the latest thoughts and insights into current trends.